Combined Installations | Dutch Thermal Engineering n.v. 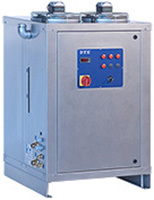 Many industrial processes involve both heating and cooling. DTE develops combined installations for these situations, called CombiMaster. 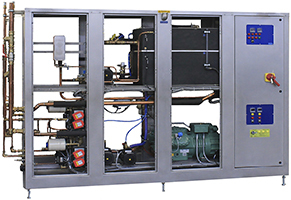 We produce an installation with cooling and heating or tempering sections combined in one machine. Based on the information provided by your company. The great advantage is that one machine does exactly what your process needs on the basis of the built-in controller or external signals. This makes communication problems a thing of the past. Plastic production, such as die-casting machines and extrusion lines. Packaging sector for heating and cooling moulds. Chemical processes that require heating during the start-up and cooling during the reaction. Confectionery sector, where heat is frequently required at the start of the process and cooling at the end of the process. Every DTE CombiMaster is produced in accordance with the customers wishes.